We best describe ourselves as inquisitive tourists: not so interested in the main tourist sites of a nation. 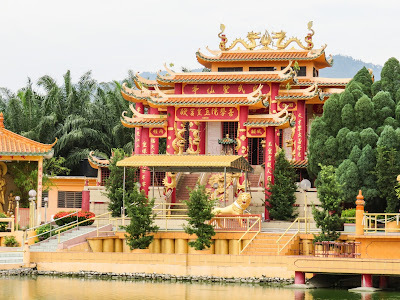 Much more interested in visiting the local places of interest… So, with this in mind, having a few spare days in the northern Malaysian city of Ipoh, we did some research, seeking out a local ‘hidden gem’. Our research encompassed Bidor, locally famous for its biscuits and mangoes; Sungkai and its Wildlife Conservation Centre; and Sungai Siput. Finally, however, we decided to stay close to our Meru Hotel in northern Ipoh: we would spend a day in and around Chemor… We would not be disappointed. A short drive of about 15 minutes brought us to the township of Chemor. From the township, it was just another two or three minutes to our first destination, the Seen Hock Yeen Temple. Driving through the ornamental entrance gates was fascinating enough. However, we were even more impressed after walking down the passageway to enter the temple compound. Kuil Seen Hock Yeen is a most beautiful temple. Its grounds cover a vast area, and one’s first gaze is captured by the beautifully landscaped ponds and gardens. 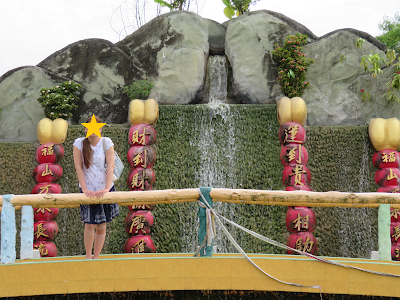 Entering further, one sees a lovely man-made cascade, beautiful temples, pavilions and pagodas, and interesting Buddhist statues. 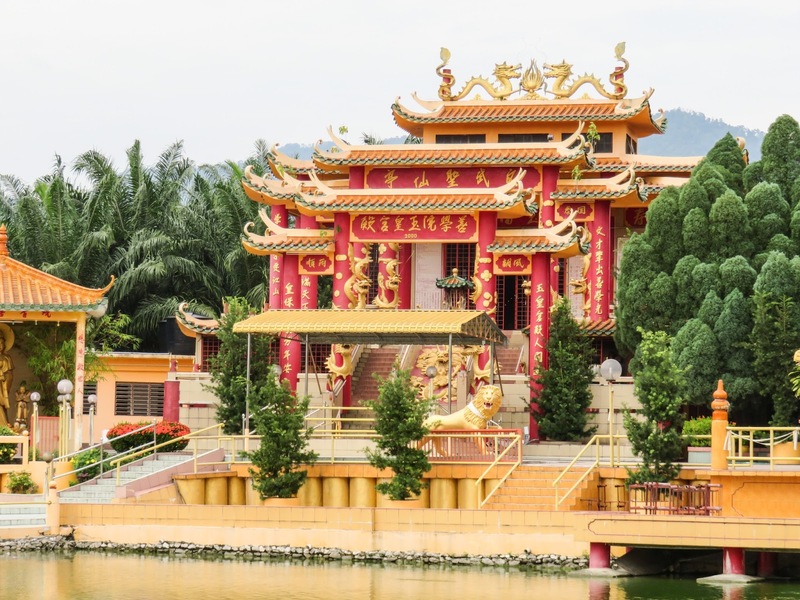 It is not until one walks further into the grounds, that one sees the beautiful temple itself, framed by reflecting ponds, tall trees and magnificent mountains. 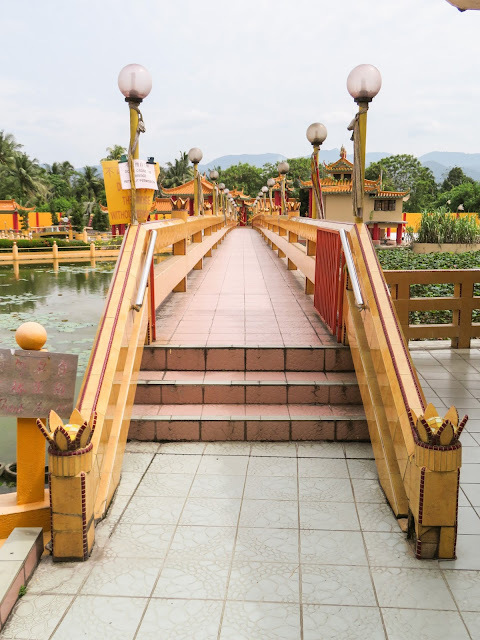 However, for me, another eye-catching and interesting structure was the Destiny Bridge, which straddles two lotus ponds. One may not cross the bridge without the permission and guidance of a temple attendant. During the guided crossing, one’s gaze should be firmly locked on the ‘uncluttered’ left side of the pond, avoiding eye contact with the densely-packed lotuses on the right. The crossing is a cleansing ritual, symbolic of personal freedom from worries and bad luck, freedom from life’s clutter. Clutter to the right, clarity to the left... Which way would you look? The courtyard of Kuil Seen Hock Yeen also contains a display of the twelve animals of the Chinese zodiac. 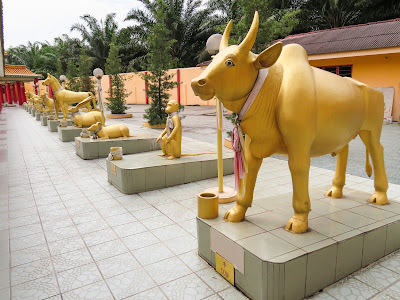 Each of the statues is painted in gold. And have I mentioned the lovely avenues of ixora and other flowering plants? Judging by the size of the temple carpark, Kuil Seen Hock Yeen can become very busy, especially during important festivals and on weekends. After a busy morning, admiring a beautiful Chinese temple, one needs to eat. 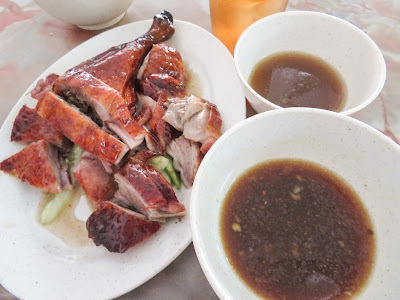 Now, the Better-Half likes her duck, and I had read that there was a fine duck restaurant, New Old Friend Restaurant, at Kampung Kuala Kuang, just a few minutes’ drive from Chemor. This became our second destination for the day. We arrived a little before one o’clock… to discover that the restaurant was down to its last roast duck. Quite clearly, the restaurant had had a steady stream of passing locals popping in for duck take-away. With great fortune, we sat and enjoyed our delicious meal, while at least four unlucky customers were turned away empty-handed. If you are intending to visit this little restaurant, plan for lunch a little earlier so as not to be disappointed. 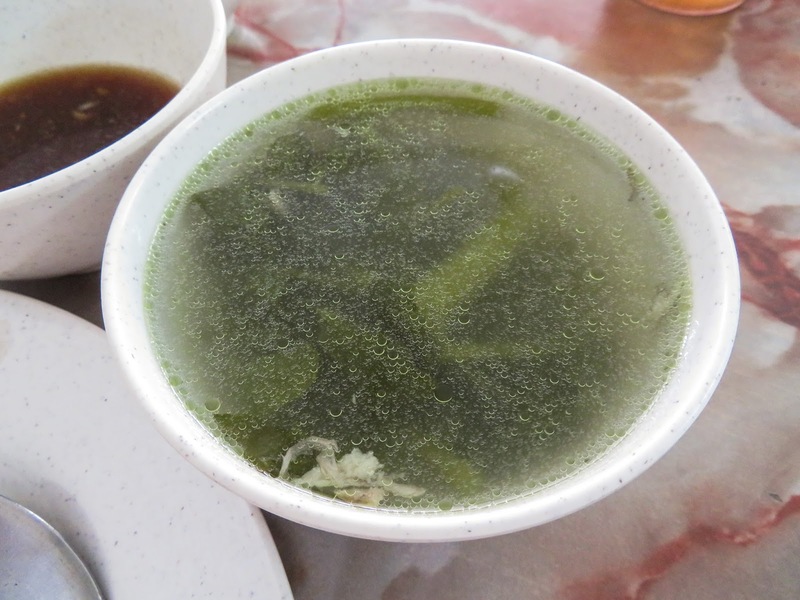 However, should you miss out on a duck treat at Kuala Kuang, there is a second Old Friend Restaurant in Chemor itself. This restaurant is managed by the owner’s son, and is open every day for lunch except for Mondays, Tuesdays and Fridays. To end our day, a little nature was called for. On the return journey to our Meru hotel, we decided to ‘pop in’ to see Lata Ulu Chepor. Turning right from the main road towards Kampung Ulu Chepor, we followed a narrow road down to a check-point. Because this was a public holiday, we were required to pay a RM 2 entry fee before proceeding to the ‘falls’. I use the term ‘falls’ loosely, as the stream was, in fact, a series of riffles and small rapids. Many families had taken advantage of the holiday to bathe and play in the cooling stream, preparing picnic-style meals on the banks. 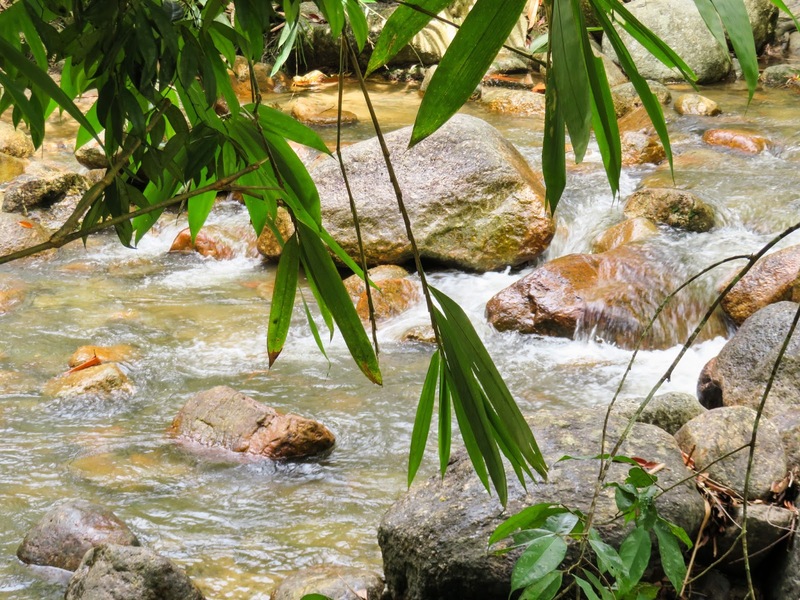 As a venue for a cooling dip on a hot Malaysian day, Lata Ulu Chepor is ideal. However, it would perhaps be less populous midweek during school term, with children returned to school and families back at home and work.